Breakfast was good. Wifi and cleanliness was better. Room was spacious and new, bed was comfortable. Worderful hotel. The tranfer service from the hotel to the Convention center is fantastic! 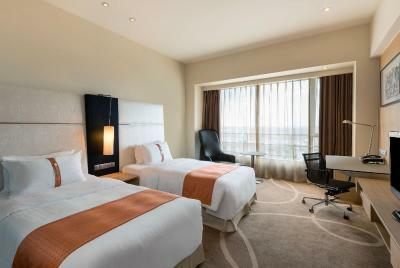 The size of the room, cleanliness, facilities. Shuttle bus to International Exhibition centre. Room was spacious, clean, pillows so soft. Shower head was so good and huge space. our Third stay in a row at this Hotel , best Value for the money if you book the Club package , this time I did write in Booking.com that I wanted a bathtub and Club floor for the room and we did get both item we asked for , PERFECT Service ! a nice big room , with very nice soft pillows , great service in the Club Lounge , also this time great service , and free stuff if you book the Club package ( free cleaning of clothes , per day , also free minibar items per day , only soft drinks ) this time I came with my own car , always a reserved parking either upstairs or Downstairs in the Parking Garage. Perfect . also another visit to the pool , bit cold , but still worth a visit . thanks to the team of the Hotel for all the Help ! second stay at this hotel , this time we arrived with the car , we did get nice parking right in front of the Hotel , this time a room in the high floor but without tub , last time we where asked what we like , this time not , the booking was with Clubroom access which is great , free drinks , a nice breakfast , and happy hour with drinks and some food , always good , also nice pool area , the pool is small but very long , Nice ! we did eat at the Hotel in one of the restaurants , also very good , nearby a convenient store ,the Hotel is a bit far from the city but for us the perfect location . 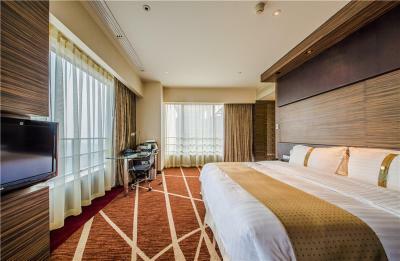 One of our top picks in Qingpu.Holiday Inn Shanghai Hongqiao West is located in Qingpu District, which is close to Hongqiao Railway Station. Just a 15-minute drive from Hongqiao International Airport, Holiday Inn Shanghai West is well managed by the InterContinental Hotel Group (IHG). Free shuttle bus can be offered between hotel with East Xujing Station (Line 2). Free WiFi is offered. 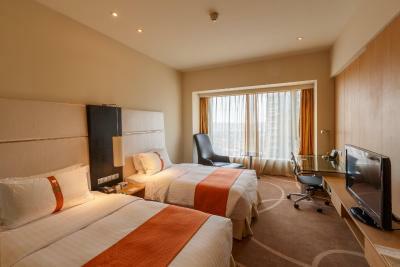 Holiday Inn Shanghai Hongqiao West is a 5-minute drive from National Exhibition and Conference Center. Shanghai South Railway Station is a 30-minute drive away while Shanghai People' Square and The Bund are a 45-minute drive away. It takes an approximately 1-hour by car to Pudong International Airport. Suzhou and Hangzhou are around a 45-minute drive away. 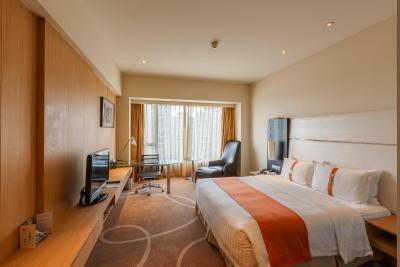 All rooms feature free Internet access and LCD TVs with cable and satellite channels. 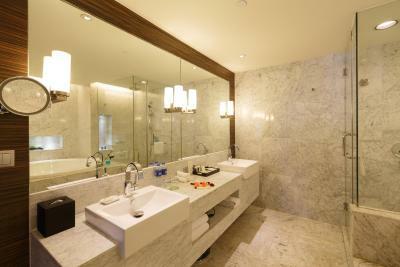 Air-conditioned rooms are equipped with ironing facilities and safety deposit box. 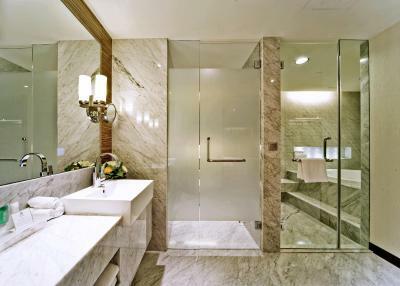 Complete with a hairdryer and a bathrobe, private bathroom also has slippers and free toiletries. Both bath and shower are available. The hotel has a fitness center with modern equipment and an indoor swimming pool. The Mandala Spa offers both Western and traditional Chinese massage methods. 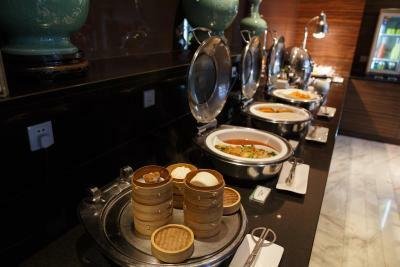 The Holiday Inn Shanghai’s International Cafe offers fresh seafood and international cuisine. 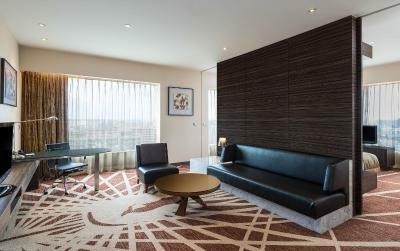 Some rooms include access to the executive lounge where complimentary breakfast and evening cocktails are served daily. 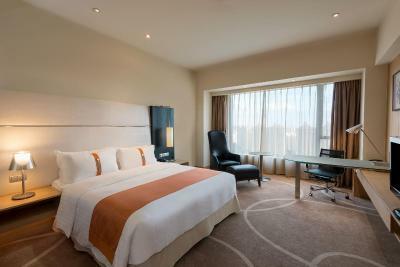 When would you like to stay at Holiday Inn Shanghai Hongqiao West? Features Executive Lounge benefits including free internet access and free beverages. This twin/double room features a mini-bar, air conditioning and flat-screen TV. 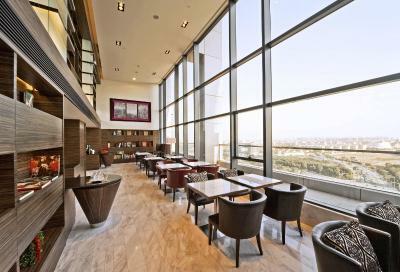 The room type includes club lounge access and its privileges. The suite features a separate living area. 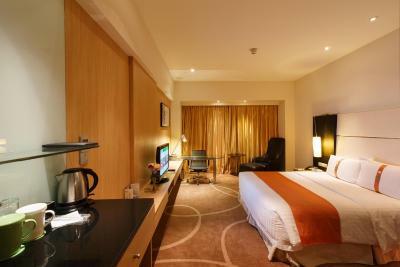 Room offers tea/coffee bags, a 32-inch flat-screen satellite TV, a mini-bar, an in-room safe and ironing facilities. 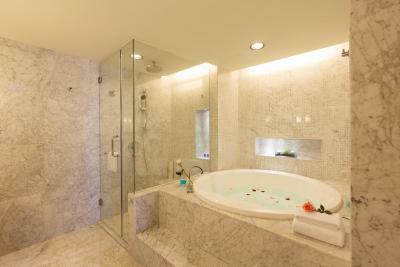 The private bathroom has a bathtub, soft bathrobes and rain showers. Please note that smoking is not allowed in this room type. The hotel is ideally located in Qingpu district, close to the world’s largest National Exhibition and Conference Centre in Asia, Hongqiao International Airport and Hongqiao Railway Station. Holiday Inn Shanghai West provides guests with 400 contemporarily designed rooms, 2600 square meters of meeting facilities, all-day-dining restaurant, Chinese restaurant, Japanese restaurant, a crossroads pub, as well as an in-door swimming pool, gymnasium and spa. There are varieties of tourist attractions near the hotel, such as: Yintao Golf Club, Outlets, Zhujiajiao (water town) and Shanghai international Circuit, making Holiday Inn Shanghai West perfectly situated for both leisure and shopping. House Rules Holiday Inn Shanghai Hongqiao West takes special requests – add in the next step! All older children or adults are charged CNY 191 per person per night for extra beds. Greatwall Dragon Holiday Inn Shanghai Hongqiao West accepts these cards and reserves the right to temporarily hold an amount prior to arrival. Holiday Inn Shanghai Hongqiao West accepts these cards and reserves the right to temporarily hold an amount prior to arrival. Location is not good at all if you are staying for more than one night. No direct access to the metro so you always have to take cab which is expensive and time consuming. Not many food options available nearby. No metro access which makes your commuting quite hectic. The room was hot and the a/c can't be controlled, in the end .. I have to open the window to get some breeze Very disappointing experience. Breakfast! Totally different from what it was shown on the pictures. Most of the food is Chinese which is strange when there are so many foreigners who stay in this hotel. Wifi very-very slow and unstable.